Note : The Cool Kids are a hip hop duo from Chicago, Illinois and Detroit, Michigan. The duo consists of Antoine "Mikey Rocks" Reed (originally from Matteson, Illinois) and Evan "Chuck Inglish" Ingersoll (originally from Mount Clemens, Michigan). "The Bake Sale" is the highly anticipated debut CD from the breakout Chicago-based duo known as The Cool Kids. The Cool Kids have literally taken over the music press for the last year - Rolling Stone, Spin, Vibe, XXL, Urb and countless other magazines have acknowledged the Cool Kids as the next band that will change the way we think and feel about music on a large scale. 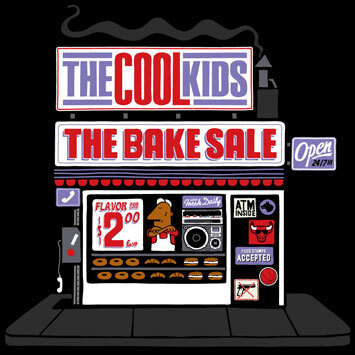 THE COOL KIDS DROP "THE BAKE SALE" EP May 20th on iTunes and in Stores on June 10th On Tour Now; Listen to "What Up Man"
In the packed confines of clubs around their hometown of Chicago and throughout the world The Cool Kids' irresistible, hooky rhymes and club cramming beats seamlessly bridge the old and new schools of hip hop while assuring them a sure-fire path to world-wide attention. In their short amount of time as a duo The Cool Kids have been featured in Rolling Stone, XXL, The Source, Spin, Paper Magazine, CBS News, The New Yorker, The Fader, and on the cover of The Urb - all without a single release to their name! Chuck Inglish (23) and Mikey Rocks (20) met on MySpace in 2005 while Chuck was attending Illinois Art Institute in Chicago and Mikey was still in High School. In August 2006, under a year from their formation, the duo began performing at venues and parties around the city. They grabbed the attention of breakout DJs Flosstradamus, who were responsible for a much-hyped monthly dance night at the Town Hall Pub in Chicago. They invited The Cool Kids to appear and word of their energizing performances spread quickly. In March 2007 The Cool Kids joined Flosstradamus and other Chicago artists for a show at SXSW. Following this performance and an appearance at the WMC in Miami with A-Trak, The Cool Kids began grabbing the attention of national media. After hosting reviews of several of their mp3s, Pitchfork offered The Cool Kids a coveted spot at the 2007 Pitchfork Festival, where they shared the stage with De La Soul and Clipse. Impressed by their talents, DJ Benzi gave the duo space in a track entitled "Getting It" where the two decidedly hold their own pitted against Lil Wayne, one of the most inventive, competitive, and successful MCs in the world. Their songs "Mikey Rocks" and "88″ have been featured in the HBO series Entourage and the game NBA Live08, respectively. The video for the debut single "Black Mags." was featured on MTVu's Freshman Five. They concluded 2007 with a 30-day, sold out tour with M.I.A., bringing their tally of performances to over 150 for that year. Early on The Cool Kids established their own "Creating Art for Kids Everywhere" recordings - the label under which the duo have written, record, and produced all their own music. Initially, the duo planned to release their own album on C.A.K.E. in July 2007. Due to such tremendous success in such a short period of time the release date was pushed back. "We thought we'd only need to press up a thousand CDs at best," said Mikey. "But when we started getting messages from Sweden, Iceland, France and Germany we knew this may be bigger than we can handle at this stage." Last October The Cool Kids signed a deal with Chocolate Industries. The highly anticipated debut EP "The Bake Sale" is expected early Spring 2008 on C.A.K.E. / Chocolate Industries.